Local couple Tom and Jo absolutely love camping. They spend most of their weekends on the road discovering all that Norfolk’s countryside and coastline has to offer with their dog Bowser. Camping and the countryside is in their veins: Tom lived in a tent for a summer (that is another story) and spent his youth camping with friends here, there and everywhere; and Jo spent her childhood camping all over the UK and France. In 2016, Tom and Jo decided to purchase the Hickling field and create the kind of campsite they would like to use. After planning approval, Tom (local farmer by trade) got straight on his beloved JCB and set to work fixing up the completely overgrown and unloved field. They agreed it was important for their campers to feel and be as outdoors as much as possible, therefore you’ll find outdoor washing up sinks on all sites. 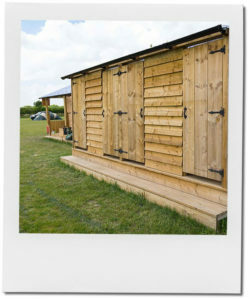 Every facility is top-notch quality but made to be in keeping with the surrounding countryside. Tom and Jo have planted 300 raspberry canes, as well as apple trees and cherry trees around the sites, to really enhance a bit of that ‘living off the land’ experience that we all enjoy about camping. Tom was absolutely adamant that all the sites should have excellent hot showers. 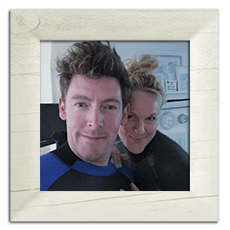 His camping mantra is that ‘as long as you have an amazing shower, you don’t need anything else!’ Jo and Tom absolutely detest set pitches because of its inflexibility and the arguments it can create (“excuse me your guy ropes are on MY SIDE of the line”). They feel it takes away from the whole essence of being free and at one with nature, and is especially irrelevant if you are camping with friends. 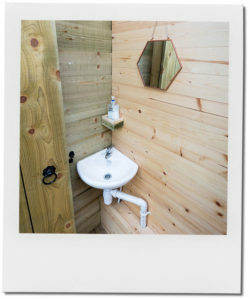 Tom, his brother Isaac and their friend Dom knocked up the super impressive shower and toilet block, and the gates were flung open at the tale end of summer 2016, with only a few happy campers pitching up, as Jo sat outside her tent collecting monies and selling firewood. Two years on and Hickling has become the thriving family-friendly campsite that Tom and Jo set out to create: a no-frills base to discover what the beautiful county of Norfolk has to offer; a place where fellow nature lovers can appreciate simple living and enjoy chatting around a campfire with a few beers under a canopy of stars (as well as having the all important super-hot shower and clean toilets a stone’s throw from your tent). Tom and Isaac have gone on to hand build four shepherd’s huts and Isaac has built an all singing, all dancing Pod, which features the only plug sockets and lights onsite. Meanwhile, local farmer Luke came to look at the Hickling site and was impressed enough to ask Jo and Tom to work their magic on his field at nearby Dilham. Without further ado the intrepid couple got to work building another set of showers and a toilet block and before Luke, Tom and Jo knew it, Canal Camping was up and running. 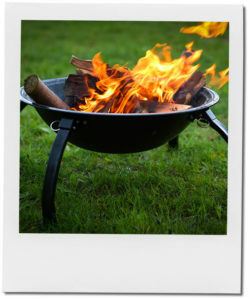 Tom and Jo also believe that a fire is an essential part of the camping experience, which is why you’ll find specially made braziers on both sites, to save you the trouble of making your own. Each fire pit has a unique long-legged design, to save unsightly scorch marks on the grass. Tom diligently spends most of the winter chopping and stacking enormous piles of (sustainable) wood at home on the farm, so there is plenty available for campers to purchase in the summer. (Marshmallows are of course the essential partner to an outdoor fire and are available to buy on site). Hickling Campsite is at the heart of the largest broad in Norfolk, and is the perfect base to pitch up and go exploring the region’s outstanding coastline… a cycle ride away from award winning, secluded, yet vast sandy beaches; and under a mile’s walk to Hickling’s quaint, traditional village pub, The Greyhound, as well as The Pleasure Boat Inn which looks out over the broad itself, and is the perfect place to relax while watching boats gliding by. Hickling Broad is an absolute haven for wildlife too, being a national nature reserve in the care of the Norfolk Wildlife Trust, there are plenty of boat trips around the reserve for visitors to explore, as well as numerous family-friendly activities and events. Or if you fancy taking to the water yourselves, with 125 miles of navigable waterways Hickling Broad is the perfect place to take the helm. Canal Camping is located in Dilham, which is only a ten-minute drive from Hickling and is nestled among the water, the reeds and the beautiful skies. Canal Camping caters for those that are looking for a relaxing, natural adventure, with the added bonus of being able to walk out of your tent, launch your canoe and drift along one of the country’s most unique canals. Tom and Jo have 10 canoes ready for hire, direct from the campsite (but feel free to bring your own). The stretch of canal campers can explore from site hasn’t been touched for more than 70 years, and Tom and Jo spent a few weeks on their canoe clearing the canal ready for people to enjoy. It is truly a hidden gem! Canal Camping is a much bigger site than Hickling, twice the size in fact and is a superb base for large groups. The site is only a short walk away to two super pubs too.